My dog recently got a bug bite on his leg. Unfortunately, he licked that spot repeatedly until the area became raw and hairless — much like a hot spot. Fortunately, I caught it before it had become oozy and infected. But it was clear that I had to do something to keep him from licking it, or it would become worse. I had an old-fashioned e-collar for dogs stashed away in the closet from his post-surgery days several years ago. It still fit, but it was so big and clunky that it was awkward for him to eat, drink, lie down, and go outside with ease. So I decided to see what other types of e-collars existed these days. I found one that worked perfectly for us! I found this inflatable dog collar, and I think it’s the perfect replacement for those hard plastic Elizabethan collars for dogs. It’s shaped like a U (or a horseshoe) — much like a traditional travel pillow that many of us use on airplane rides. Just to clarify… for the first couple days that my dog had this irritated spot on his leg, I simply used a hot spot home remedy that a veterinarian had taught me using self-adhesive bandage wrap. It is only after those first couple days that I started using the inflatable e-collar. Since it’s important that the wound be exposed to the air in order dry out and heal, I didn’t want it to remain wrapped up behind a bandage for too long each day. At the same time, I didn’t want to make my dog wear an ecollar longer than he had to. In the morning, as long as Tenor was in the room with me, I’d watch him like a hawk to make sure that he would’t lick the bandage — without the ecollar on. The moment he leaned toward the spot, I would immediately say “NO!” It startled him so much (and he’s a rather submissive dog who’s always eager to please anyway) that he wouldn’t lick it — not while I was watching. 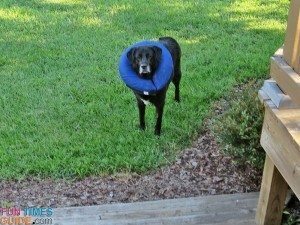 The first moment I realized that I would no longer be able to keep my eyes glued on him, I took off the bandage wrap and put on the inflatable dog collar. I’d give him a stuffed Kong toy to distract him for awhile. He kept the e-collar on all day long (with no bandage wrap) until it was time to go to sleep at night. This allowed plenty of time for air to reach the sore in order for it to heal naturally. Then at night, I’d take off the inflatable dog collar, let him go outside, give him a treat, and play with him a little bit. Then the first moment I stopped keeping my eyes glued on him, I put some self-adhesive wrap over the spot to keep him from licking it all through the night. Then I’d give him another stuffed Kong toy to distract him for awhile. My dog did great with this routine. 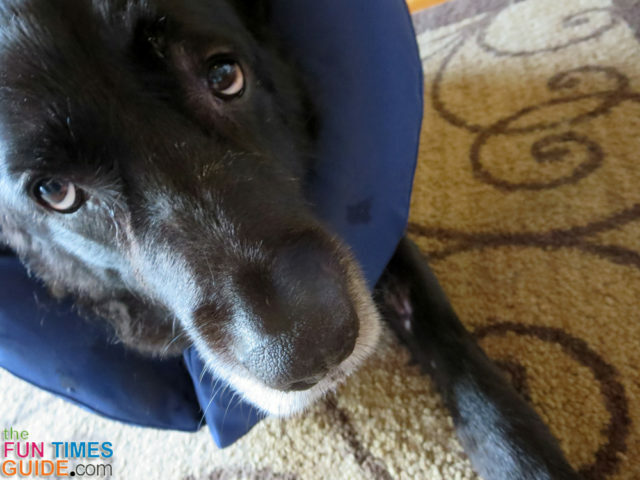 He always kept the bandage on through the night — which meant there was no licking! Eventually, I stopped wrapping the wound at night — so even more air was getting to it round the clock. But if it looks like your dog has been licking the bandage during the night, then I’d keep the inflatable collar all day & night for a few days in a row — any time your eyes aren’t glued on your dog in order to stop the licking. Just take it off for short periods to play with your dog, then put it back on — like it’s your dog’s new uniform. After the first couple of days, you don’t really need to use the bandage wrap while the e-collar is on. Allowing the wound to be exposed to the air for long periods of time will actually help it heal faster. The bandage is really only helpful during those first few days as a way to “treat” the sore. After that, it’s only necessary to keep your dog from constantly licking the wound whenever he’s not wearing an e-collar. Inflatable Dog Collars Are Super Comfortable! In case you’re wondering… yes, he could eat, drink, get food out of a Kong toy, go up and down stairs, go outside, and even sleep with the inflatable e-collar on. He got used to it really quickly and always seemed very comfortable with it on. The cover is soft and durable. I just took a damp cloth to it occasionally to remove the doggie drool that had accumulated on it. 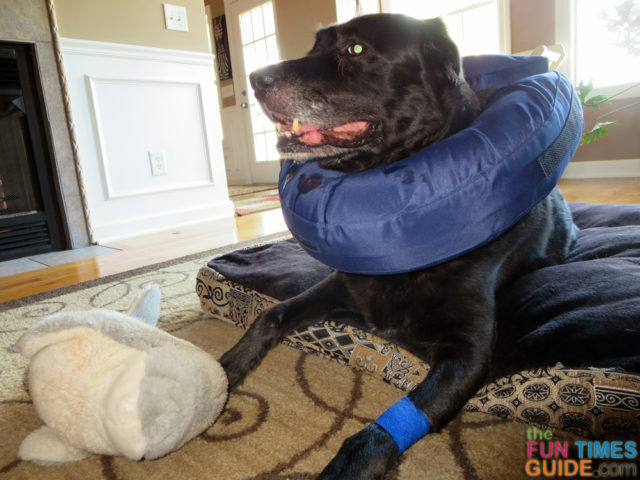 The inflatable e-collar is a little smaller in diameter (15″, compared to 17″ for the same sized plastic ecollar) — which means it’s less restricting for your dog’s comfort level. The range of motion is greater with the inflatable dog collar (about 8-9″ from the dog’s nose to the ground, compared to 11-12″ with a plastic ecollar) — which means your dog will be able to reach (lick!) 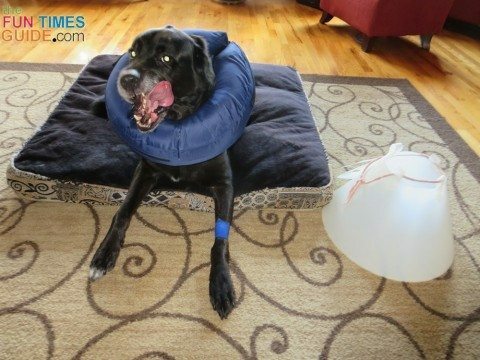 more places on his body while wearing an inflatable e-collar. I was lucky — the spot on my dog’s leg was high enough that the inflatable dog collar worked. It prevented him from reaching the spot, so he couldn’t lick it. But if the hot spot was closer to his paws, then the inflatable collar would not have worked. For the record, I think it would have worked well after my dog’s neuter surgery. I’m not 100% sure whether it would have worked after my dog’s knee surgery or not. I wish I had tried it at the time. At the very least, it would have been a more comfortable option toward the end of the recovery period when it became less and less critical to protect that area of his leg. To put on the inflatable dog collar: Inflate the collar first. Remove your dog’s normal collar from around his neck and loop it through the inner straps of the inflatable dog collar. Then, slip the inflatable collar over his head and clip his normal dog collar closed around his neck. Finally, there are 2 black straps — the shortest one attaches to the closest velcro tab inside the cut-out part of the collar; the longest one attaches to the long strip of velcro on the outside edge of the collar to keep the collar securely closed. 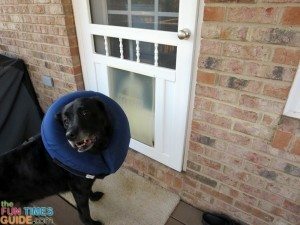 To take off the inflatable dog collar: Simply un-clip your pet’s normal dog collar that’s been looped through the inside straps of the inflatable dog collar. That’s it! For what it’s worth, I added a little more air to the collar every other day or so — whether it looked like it needed it or not.